Concentric Pumps Ltd. the leading manufacturer of oil, fuel and water pumps for medium to heavy diesel engines, has gained accreditation to the updated and demanding environmental standard ISO14001:2004. 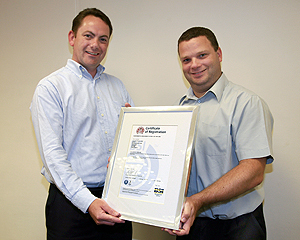 The accreditation process was carried out by BSI and the award certificate was presented at a ceremony in Birmingham on 22 June, 2007. This certificate covers the UK manufacturing plant and technical centre in Birmingham, but the company's other plants in the USA, India and China are also working towards achieving the same standard. David Woolley, Managing Director of Concentric Pumps Limited, commented: "This has been an intensive one-year project. Before, approximately 90% of our waste went to landfill, with only 10% being recycled. Only twelve months later, those percentages have been reversed: waste has been reduced by 80% with consequent reductions in tanker journeys, fuel use and emissions. Everybody in the company has worked very hard on this project and the team led by James Norris and Brian Mason has made a very significant contribution to the environment." Concentric has implemented a fundamental change in its approach to waste management and the company's overall carbon footprint. The company now purchases only "green" electricity, waste water is filtered so that it can be safely returned to the foul drainage system and waste streams are separated to minimize landfill and maximize recycling. Cardboard, paper and plastics packaging are compacted, wood is crushed and both, along with aluminium, steel and cast iron waste, are removed from site for recycling. As an engineering company, Concentric uses large quantities of oil. This is now filtered and recycled, while solvents have been virtually eliminated. The ISO 14001 standard covers a broad range of environmental concerns, not only pollutants and waste in general, but also such issues as recycling, noise, energy consumption and the interface and visual impact of the workplace on the local community. The presentation of the certificate confirms the commitment of Concentric Pumps both to the continual improvement of its processes and the reduction of its impact on the environment. Concentric plc is a major supplier to the world's, truck and construction equipment industries, manufacturing lubrication pumps for transmissions and compressors as well oil, water and fuel pumps. The group centre of excellence for design, development and engineering is located in Birmingham, UK.